Acute small bowel obstruction (SBO) is a relatively common cause of emergency hospital admission, most frequently due to postoperative adhesions. With increased experience and technical advances in laparoscopic surgery, the laparoscopic management of acute SBO has become feasible and potentially superior to the open approach. This retrospective study presents the authors’ experience with laparoscopic treatment of SBO over a 6-year period to assess the feasibility, efficacy, and clinical outcome of this therapeutic method and to present the author’s methodology. 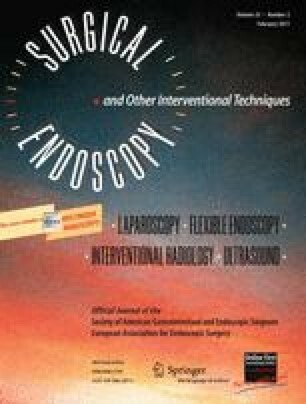 From April 2003 to January 2009, 32 patients hospitalized in the author’s department for acute SBO underwent elective laparoscopic treatment after failure of conservative measures. Standard laparoscopic techniques and instruments were used. Postoperative adhesions were identified in 62.5% of patients (n = 20) as well as tumor (n = 3), incarcerated ventral hernia (n = 4), incarcerated femoral hernia (n = 3), internal hernia (n = 1), and Crohn’s disease (n = 1). The conversion rate was 18.7% (n = 6), and the postoperative complication rate was 3.25% (n = 1). The mean operative time was 78 min. Bowel function returned after a mean of 3.2 days, and the mean hospital stay was 4.6 days. Ioannis Tierris, Constantinos Mavrantonis, Constantinos Stratoulias, George Panousis, Afrodite Mpetsou, and Nicolaos Kalochristianakis have no conflicts of interest or financial ties to disclose.